Potentiometer taper is the relation between the position and the resistance of a pot. 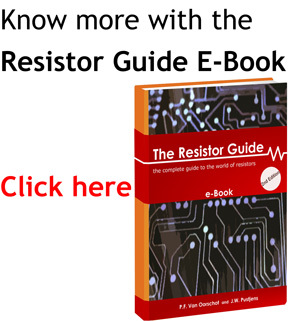 In the majority of variable resistors available this is a linear relationship, meaning that the relative position is equal to the resistance ratio. For example when the potmeter is at the middle position, the output voltage is half of the full voltage over the potentiometer. For some applications and especially audio volume control, non-linear, logarithmic tapers are used. Taper is the relation between the position of the potentiometer and the resistance ratio. The simple linear taper is the most common form, when we plot the position against the resistance ratio we can visualize the different position-resistance relations. The graph below shows the most used tapers. The first and last few percents of travel are often only mechanical with no change in resistance. The region between 5 and 95% where the electrical resistance changes is called the electrical travel. The available travel for rotary pots is often denoted in degrees, a mechanical travel of 300° combined with a electrical travel of 270° is common. 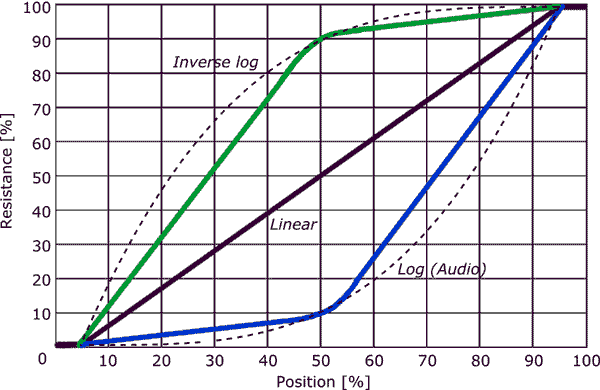 The most used non-linear taper is the logarithmic (log) or audio taper. This is mainly used for audio volume control, to obtain a more natural ‘linear’ perception in sound intensity change when you adjust the volume. Because the human ear is sensitive to sound intensity in a logarithmic fashion, at low sound intensities a small change in intensity is perceived as a big change in loudness, while at high intensities a large change is required for the same change in perceived loudness. To compensate for the ears logarithmic behavior, audio taper pots were developed. While it is called logarithmic, it is actually an exponential curve (the opposite of the logarithmic behavior of the human ear). Sometimes inverse logarithmic (anti-log) pots are used, for example in audio controls which turn counterclockwise, but also in some other specialized applications. The dashed lines in the graph below show the ‘real’ logarithmic curves. In practice logarithmic types which are used for audio applications do not really behave in a correct exponential way, but follow the curve stepwise. The blue line shows the actual taper curve of an audio potentiometer. This approximation is done because it simplifies the manufacturing process. Instead of a continuously varying resistance tracks, two different tracks are used which overlap at the middle position. As audio volume control is a non-critical operation in general this satisfies for these applications. There exist tapered potentiometers with real exponential curves for specialized applications. Tapered potentiometers are marked with an additional letter, either as a prefix or suffix. The table below lists some common marking codes. Unfortunately there are several different methods of marking which also have some overlap and can therefore be confusing. The most common marking method is the Asian method which uses B for linear taper and A for audio taper.